In this part 3 of the Wharfedale Diamond 10.2 review I un-mount the drivers, cross-over, ports damping material and examine the cabinet construction in detail. I show the individual drivers T/S parameters, frequency response, impedance plots and distortion profiles. Note! In the review part2 I described the issues I had with the driver units in the right loudspeaker and that I received replacement drivers from my local Hifi Shop and supplier. Some of the measurements shown here don’t include the new replacement drivers. Removing the drivers from the enclosure is very simple. 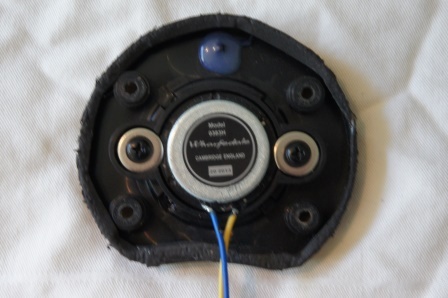 The mid-woofer is attached with six screws and the tweeter is attached with four screws. After removing the mid-woofer screws it pops out by itself. The tweeter is easiest to remove by pressing it out from behind. 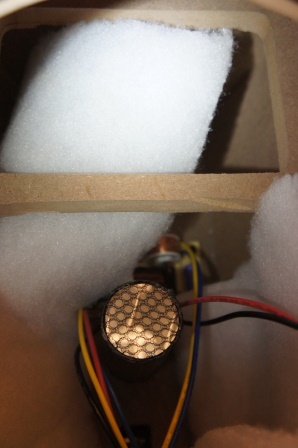 Both the tweeter and the mid-woofer are almost entirely missing applied gasket tape for sealing and making the driver’s air tight attached to the enclosure. The damping material consists of a folded 20x60cm sheet made of polyester attached in the back of the enclosure. 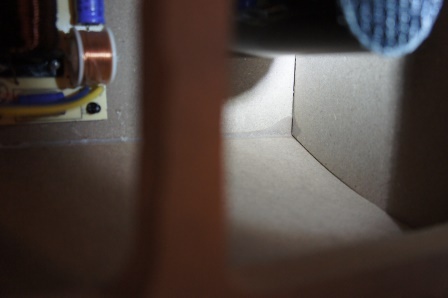 As I described in the first part of the review the damping material was rather sloppy applied in the enclosure and in one of the loudspeakers the bass-reflex port was blocked by the damping material. This is however fortunately very easy to correct. In the middle of the enclosure we have a 16mm MDF brace from bottom to the top. The bass-reflex ports aren’t glued so they can be removed by pressing them out from behind. The ports are “child proofed” by using a net in the end of the port in order to prevent any foreign objects to be pushed into the enclosure. The MDF joints doesn’t have any form of sealant to make the enclosure 100% air tight, but in some places excessive glue acts as a form of sealant. The cross-over is attached with four screws to the back of the enclosure and placed between the two bass-reflex ports. The cross-over is very simple and consist of only five components. Electrically both the mid-woofer and the tweeter uses a second-order filter and in series with the tweeter filter section there is a single wirewound ceramic resistor for tweeter attenuation. Both drivers are connected with the same polarity. The cross-over components are of cheap quality and consist of electrolyte caps and an iron-core coil for the mid-woofer cross-over section. The component tolerances are within 5-6% which is good, but not great. 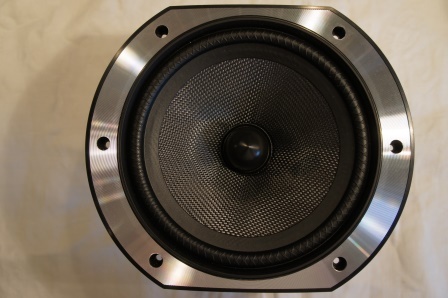 The mid-woofer cross-over coil have surprisingly, slightly different values which by the look of them could be explained and caused by using coils from different manufacturing batches. 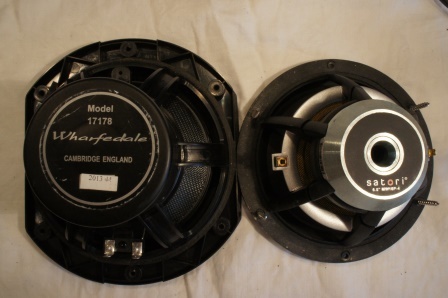 The mid-woofer model is 17178 and the two driver samples seem to have different manufacturing weeks, 201340 and 201344. 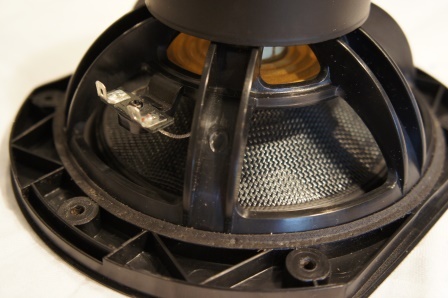 The replacement mid-woofer driver for the right loudspeaker has a manufacturing date of 201345. The mid-woofer uses a truncated frame in order to be able to fit a narrow baffle. The chassis is made of plastic and it uses a shielding cup over the tiny magnet and has a total weight of about 1kg. 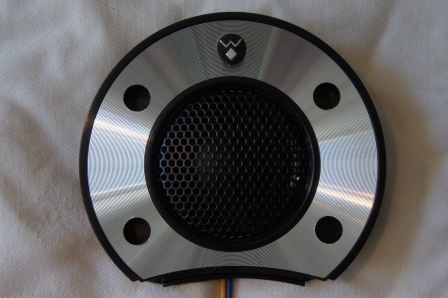 The cone is made of Kevlar and the cone area is about 150cm2 which indicates that this mid-woofer is a 7” driver rather than a 6.5” driver according to Wharfedale specifications. 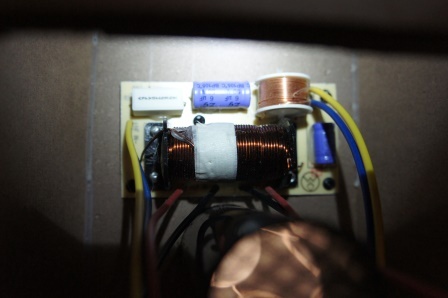 The voice coil seems to be about 25mm in size and my estimate is that the linear x-max is around 3-4mm. 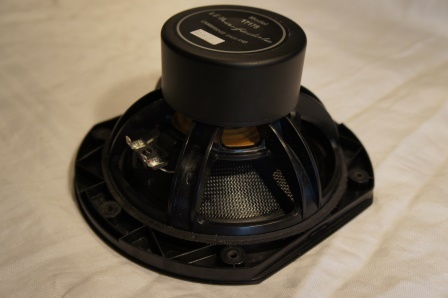 The mid-woofer uses a dust cap in the shape of a phase plug, but since it’s attached to the cone it isn’t a “real” phase plug with benefit of helping cooling the voice coil. 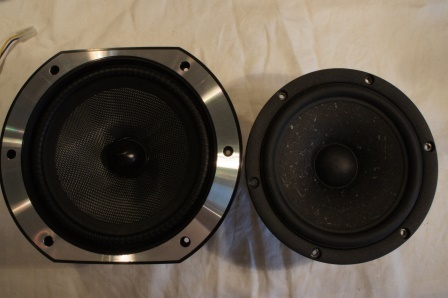 Here we can see the mid-woofer next to the SB Acoustics Satori 6.5” mid-woofer. As can be seen in the picture the Wharfedale driver is a larger driver and it’s about 15mm deeper than the Satori driver. The overall build quality seems to be rather simple and the driver in the right loudspeaker had a mechanical sound when the cone moved. This mechanical sound could actually be heard in certain bass heavy recordings. Note! The faulty mid-woofer was replaced with a new driver unit. The tweeter model is 0383H and the two driver samples seem to have different manufacturing weeks, 201320 and 201335. 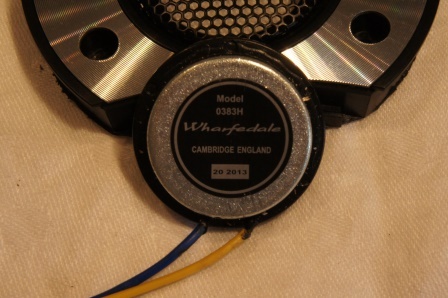 The replacement tweeter driver for the right loudspeaker has a manufacturing date of 201342. The 1” neodymium tweeter is held in place by two screws with two washers which clamp the tweeter to the design ring/front grill. Improvements to the mid/bass drive unit: To make the most of the stronger cabinet, the main drive unit chassis has been enhanced with a massive flange that is secured using six screws, thus improving its stability. 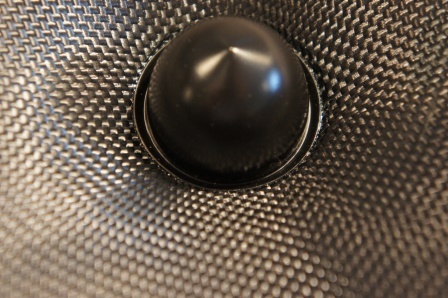 A diamond pattern has also been moulded into the surround of the Kevlar cone; this is more than just cosmetic as the pattern reduces and damps standing waves in the surround, yielding a cleaner high-frequency acoustic roll-off and enhancing the ability of the mid/bass unit and tweeter to work as a cohesive whole. Low Profile Chassis: The open nature of the chassis reduces reflection from rear cone movements, allowing air to move freely through the driver, which in turn results to an overall even response with a much lower distortion. Formed from a high density, injection-moulded polymer pioneered by Wharfedale, the chassis itself provides substantial damping of ring waves. Tweeter diffuser: Over the soft-dome tweeter is a metal diffusion grid which, as well as protecting the dome when the speaker is being used without its grille, also irons out high-frequency perturbations right up to 30kHz, delivering a smoother response and crystal-clear treble detailing. 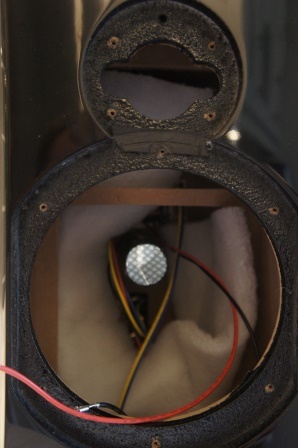 Neodymium-Powered Tweeter Mounted in Cast Alloy Surround: With the use of neodymium, the strongest of ‘rare earth’ materials, a concentration of the magnetic field is directed within the area of voice coil excursion. The cast alloy mounting plate has a profiled cross-section to optimize the dispersion of high frequency sound so it integrates flawlessly with the bass/mid-range drivers and produces a fast and more linear response possible. 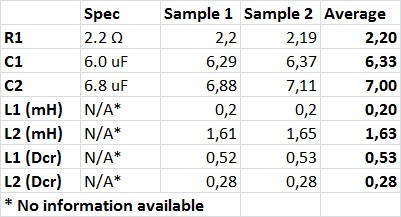 Overall all three mid-woofer samples measures about the same. The replacement driver sample three has slightly higher Qts. The measurements show that the mid-woofer is a 4 Ohm driver. 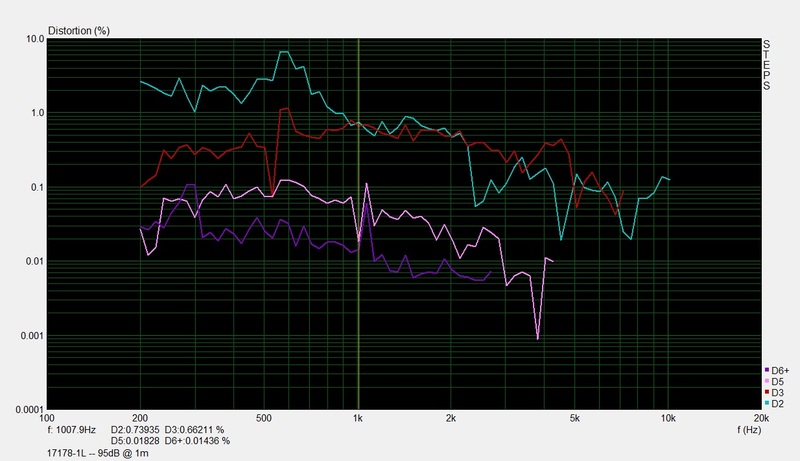 The tweeter replacement driver sample three has significantly lower Fs than sample one and two. The measurements show that the tweeter is a 4 Ohm driver. The three mid-woofer samples have almost identical impedance plots. Around 600Hz we can see a wrinkle in the impedance plot, which most likely is some sort of resonance issue. In the tweeter impedance plot we can see a rather large difference between the tweeter samples. 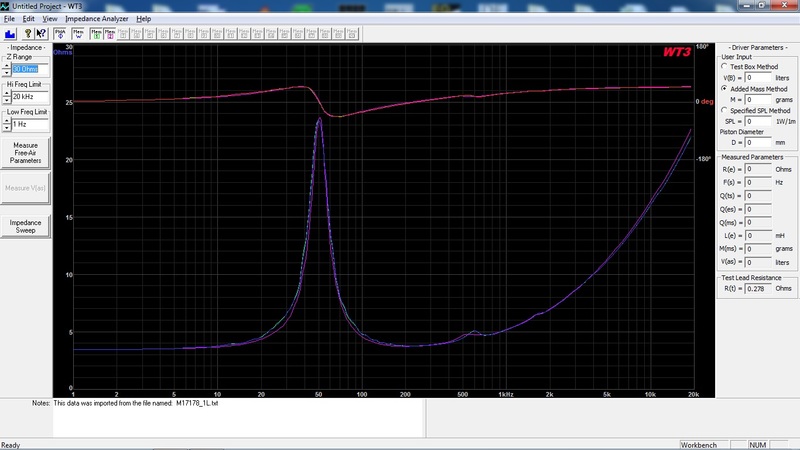 The sample #2 (green) shows an elevation in the impedance plot between 20 and 500Hz which explains the lower output from this tweeter found in the review part 1 and 2. This tweeter was replaced by sample #3 (purple) which shows a lower resonance frequency, but also a bump above its resonance frequency. 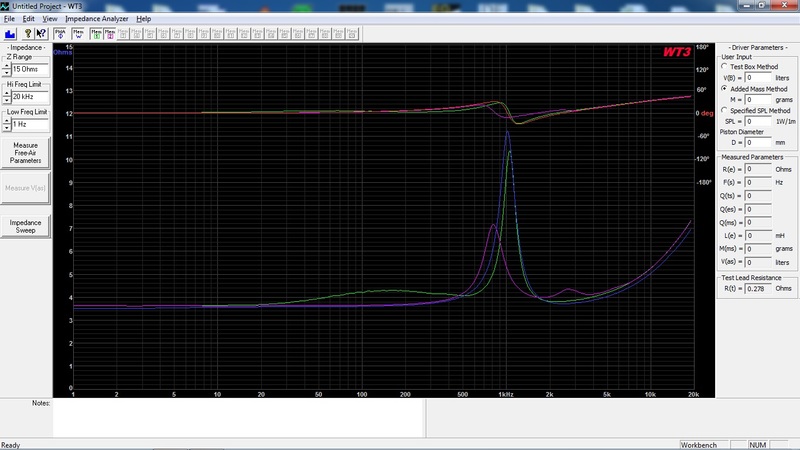 I consider the driver sample #1 (blue) to be the tweeter without issues, but the sample #3 (purple) works fine when connected to the cross-over. Driver position: Mounted on center-line with the tweeter driver unit center 7cm from the top of the baffle and the mid-woofer 20cm from the top of the baffle. Mic position: 1m distance, on mid-woofer axis and on tweeter axis. Note! The tweeter and mid-woofer replacement driver sample #3 isn’t shown in these frequency measurement graphs. 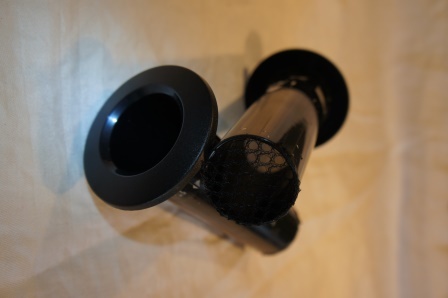 The two mid-woofer samples measures virtually the same and they have a very smooth natural frequency roll-off without any visible or sharp cone break-ups. 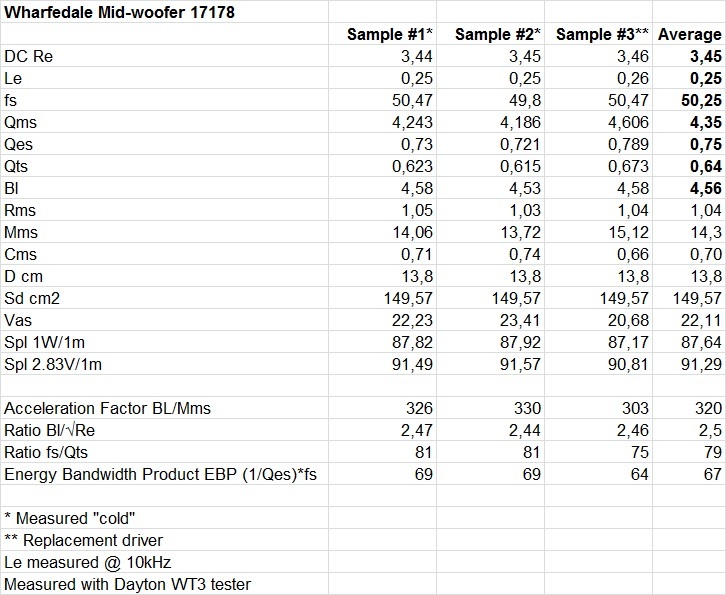 The two tweeter samples measures virtually the same, but the tweeter sample #2 has about 1.5-2dB lower sensitivity than the sample #1. The tweeter sample #2 has been replaced with a new tweeter driver unit which has the same sensitivity as driver sample #1. The tweeter has a frequency response dip around 13kHz which is most likely caused by some diffraction from the tweeter’s protective grill and its mounting. The distortion measurements are done in near-field and the amplifier output level was adjusted for each driver so that the fundamental is 85dB, 90dB and 95dB at 1m. This setting simulates normal to medium-high and high listening levels. The distortion profile is slightly above average, but decent for a mid-woofer in this price range. We have some elevated third order distortion between 500-1000Hz and the wrinkles in the impedance plot around 600Hz appears here as elevated second and third order distortion. For a tweeter in this price range the distortion profile is good in the tweeter’s usable frequency range, but the distortion “sky rockets” below 2kHz. The 95dB distortion measurement start had to be raised to 2kHz in order not to damage the tweeter. This tweeter shouldn’t be used much below 3kHz and preferable with a LR4 topology (acoustical). In the final review part 4 I will share my listening impressions of the Wharfedale Diamond 10.2 and I will also most likely give some suggestions on how to tweak and improve the performance of the loudspeaker. Go to review part 4!